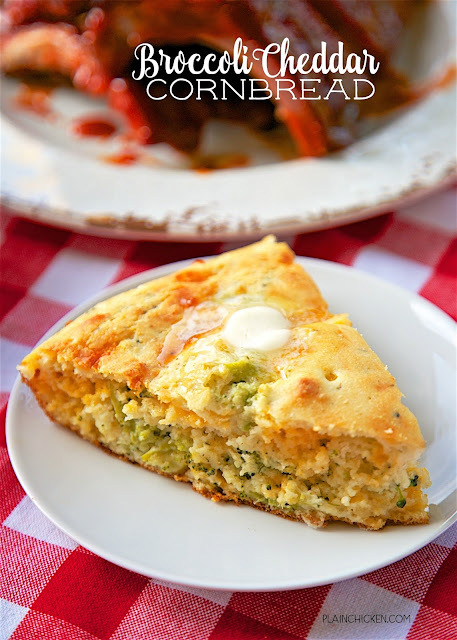 Broccoli Cheddar Cornbread - only 6 ingredients! This stuff is crazy good!! Cornbread mix, flour, buttermilk, frozen chopped broccoli, cheddar and oil. 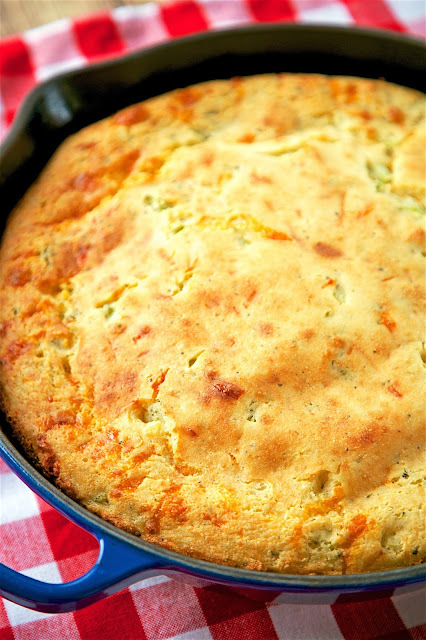 Bake in an iron skillet for the best cornbread you've ever eaten! Took this to a BBQ and there were no leftovers! Our grill has been in overdrive this summer. We grill at least three times a week. Since we grill a lot, I am always trying to come up with new side dishes. I don't want dinner to get boring! Last week we were grilling up some delicious BBQ. We love homemade cornbread with BBQ, so I decided to jazz up our usual recipe and add some broccoli and cheese. Oh, wow! This stuff was SOOOO good! We ate way too much of the Broccoli Cheddar Cornbread, and loved every single bite! It was perfect slathered with butter. YUM! This is the BBQ that we ate last week. 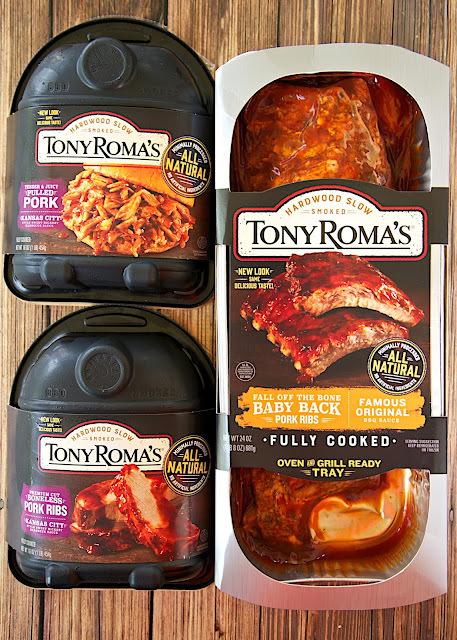 Have you seen the Tony Roma's BBQ in the grocery store? I saw them last week and decided to give them a try. I was really intrigued with the ribs - the package said they are ready in about 15 minutes. I love ribs, but they are so time-consuming to make at home. With the promise of delicious ribs in 15 minutes, I had to try Tony Roma’s Fall-off-the-Bone Pork Ribs! 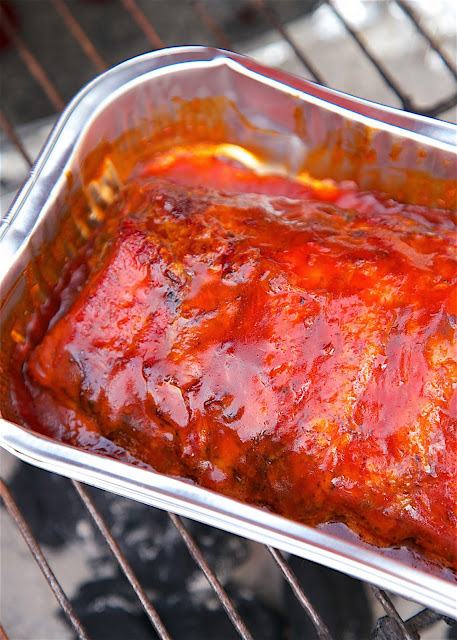 The ribs come fully cooked in a foil pan ready for the grill or the oven. We threw them on the grill for 15 minutes, basting a few times. They were just as good as any restaurants. We devoured the whole rack! I actually wish I had made two racks! We loved the ribs. I especially loved how easy they were to make. These ribs would be PERFECT for tailgating this fall. Back to the cornbread, this stuff is crazy delicious! And with only 6 ingredients, it is super easy to make. Give this a try at your next BBQ! I promise it will be a huge hit!! Pour vegetable oil into a 12-inch iron skillet. Place into cold oven and preheat to 425 degrees. In a large bowl, whisk together cornbread mix, flour and buttermilk. Whisk until smooth. Stir in broccoli and cheese. Once oven has preheated, remove skillet from oven. Pour cornbread batter into hot skillet. Return skillet to oven and bake for 35 or 40 minutes. It may not seem like a normal bbq item, but I'm allergic to red meat so I can't have the usual burgers and ribs... But when my husband is grilling his red-meat-fest :-) I love to throw a nice filet of salmon on the grill and glaze it with either a homemade bbq sauce or a raspberry-chipotle sauce. Yum! I like skewered shrimp and pineapple on the BBQ. I love bbq chicken wings. My favorite easy bbq recipe is BBQ Grilled Chicken. My favorite bbq recipe is my BBQ Ribs that I make every summer. I use Sweet Baby Rays sauce to make them taste so good. My favorite BBQ recipe is for ribs with a maple BBQ sauce. My favorite BBQ recipe is barbecued chicken strips. My husband makes them on our hibachi grill and they're delicious! I just love chicken breasts slathered in sauce and grilled until they're a little blackened around the edges...yum! I love BBQ'd chicken wings. Thanks so much. I like BBQ Chicken Kebabs. My favorite easy BBQ recipe is barbecue chicken wings. I love BBQ'd ribs - especially with Sweet Baby Ray's sauce. I love grilled chicken with a teriyaki flavored marinade. Cajun spiced chicken wings with lots of bar b q sauce. I don't BBQ often but if I do I make them in a slow cooker and they are so tender. I just really like shredded brown sugar barbecue chicken in the crockpot. I like to make BBQ chicken on the grill, basted with Trader Joe's KC BBQ Sauce. I serve it with creamy coleslaw and corn on the cob. My favorite BBQ recipe is my homemade BBQ ribs. Can't wait to try out all these Tony Roma's products. Will make weeknight dinner so easy! My fave recipe is bbq pulled pork in the crockpot! Super easy and delicious. I like to do pulled pork in the slow cooker as well. Pork + bbq sauce = easy! I've tried pulled pork in the slow cooker but I have the hardest time pulling it apart. This is so much easier! my favorite easy bbq recipe is bbq chicken w/veggies! BBQ chicken with rotisserie chciken and good bbq sauce. It's too hard to pick a favorite. I love anything smothered in BBQ! i usually use ready made bbq sauce and something easy like sweet potato fries. I make a grilled BBQ chicken breast for an easy BBQ meal. My favorite barbeque dish are ribs! I love potato salad and baked beans to go along with them. Our kids love barbeque as well. I love bbq baby back ribs. My favorite easy BBQ recipe is grilled chicken breast that we shred and make into sandwiches. I like mine topped with caramelized onions, bacon and smoked Cheddar cheese. I posted a tweet: https://twitter.com/FireRunner2379/status/810571878070972421. I like BBQ beans the pork in the crock pot....easy and my whole family likes them. Some slow cooked BBQ ribs and a side of cinnamon apples is delicious! We like making pulled pork bbq sandwiches using my Instant Pot. Thanks for sharing your cornbread recipe... looks GOOD! I don't make homemade BBQ sauce but my fav easy BBQ recipe is delicious on crockpot veggie meatballs: two jars of your fav BBQ sauce and one jar (use the juice to rinse out the BBQ sauce from the empty jars) of grape juice. SO GOOD! I love ribs. I always have to make three times more than I think we need because we all sneak out late at night to snack on the leftovers. I like making BBQ ribs. My favorite easy BBQ recipe is my famous Pulled Pork with Barbecue Sauce. How delicious it is. I like to go with pulled pork.